The Chalcolithic (English: /ˌkælkəˈlɪθɪk/), a name derived from the Greek: χαλκός khalkós, "copper" and from λίθος líthos, "stone" or Copper Age, also known as the Eneolithic or Aeneolithic (from Latin aeneus "of copper") is an archaeological period which researchers usually regard as part of the broader Neolithic (although scholars originally defined it as a transition between the Neolithic and the Bronze Age). In the context of Eastern Europe, archaeologists often prefer the term "Eneolithic" to "Chalcolithic" or other alternatives. In the Chalcolithic period, copper predominated in metalworking technology. Hence it was the period before it was discovered that adding tin to copper formed bronze (a harder and stronger metal). The archaeological site of Belovode, on Rudnik mountain in Serbia has the oldest securely-dated evidence of copper smelting, from 7000 BP (c. 5000 BC). The Copper Age in the Ancient Near East began in the late 5th millennium BC and lasted for about a millennium before it gave rise to the Early Bronze Age. The transition from the European Copper Age to Bronze Age Europe occurs about the same time, between the late 5th and the late 3rd millennia BC. Analysis of stone tool assemblages from sites on the Tehran Plain, in Iran, has illustrated the effects of the introduction of copper working technologies on the in-place systems of lithic craft specialists and raw materials. Networks of exchange and specialized processing and production that had evolved during the Neolithic seem to have collapsed by the Middle Chalcolithic (c. 4500–3500 BC) and been replaced by the use of local materials by a primarily household-based production of stone tools. The Timna Valley contains evidence of copper mining in 7000–5000 BC. The process of transition from Neolithic to Chalcolithic in the Middle East is characterized in archaeological stone tool assemblages by a decline in high quality raw material procurement and use. This dramatic shift is seen throughout the region, including the Tehran Plain, Iran. Here, analysis of six archaeological sites determined a marked downward trend in not only material quality, but also in aesthetic variation in the lithic artefacts. Fazeli et al. use these results as evidence of the loss of craft specialisation caused by increased use of copper tools. An archaeological site in Serbia contains the oldest securely dated evidence of coppermaking from 7,500 years ago. The find in June 2010 extends the known record of copper smelting by about 800 years, and suggests that copper smelting may have been invented in separate parts of Asia and Europe at that time rather than spreading from a single source. In Serbia, a copper axe was found at Prokuplje, which indicates use of metal in Europe by 7,500 years ago (5500 BC), many years earlier than previously believed. Knowledge of the use of copper was far more widespread than the metal itself. The European Battle Axe culture used stone axes modeled on copper axes, even with moulding carved in the stone. Ötzi the Iceman, who was found in the Ötztal Alps in 1991 and whose remains were dated to about 3300 BC, was found with a Mondsee copper axe. Examples of Chalcolithic cultures in Europe include Vila Nova de São Pedro and Los Millares on the Iberian Peninsula. Pottery of the Beaker people has been found at both sites, dating to several centuries after copper-working began there. The Beaker culture appears to have spread copper and bronze technologies in Europe, along with Indo-European languages. In Britain, copper was used between the 25th and 22nd centuries BC, but some archaeologists do not recognise a British Chalcolithic because production and use was on a small scale. According to Parpola (2005), ceramic similarities between the Indus Civilization, southern Turkmenistan, and northern Iran during 4300–3300 BC of the Chalcolithic period suggest considerable mobility and trade. The term "Chalcolithic" has also been used in the context of the South Asian Stone Age. In Bhirrana, the earliest Indus civilization site, copper bangles and arrowheads were found. The inhabitants of Mehrgarh in present-day Pakistan fashioned tools with local copper ore between 7000–3300 BC. At the Nausharo site dated to 4500 years ago, a pottery workshop in province of Balochistan, Pakistan, were unearthed 12 blades or blade fragments. These blades are 12–18 cm (5–7 in) long and 1.2–2.0 cm (0.5–0.8 in) and relatively thin. Archaeological experiments show that these blades were made with a copper indenter and functioned as a potter's tool to trim and shape unfired pottery. Petrographic analysis indicates local pottery manufacturing, but also reveals the existence of a few exotic black-slipped pottery items from the Indus Valley. 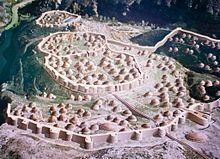 The term "Chalcolithic" is also applied to American civilizations that already used copper and copper alloys thousands of years before the European migration. Besides cultures in the Andes and Mesoamerica, the Old Copper Complex, centered in the Upper Great Lakes region—present-day Michigan and Wisconsin in the United States—mined and fabricated copper as tools, weapons, and personal ornaments. The evidence of smelting or alloying that has been found is subject to some dispute and a common assumption by archaeologists is that objects were cold-worked into shape. Artifacts from some of these sites have been dated to 4000–1000 BC, making them some of the oldest Chalcolithic sites in the world. Furthermore, some archaeologists find artifactual and structural evidence of casting by Hopewellian and Mississippian peoples to be demonstrated in the archaeological record. In the 5th millennium BC copper artifacts start to appear in East Asia, such as in the Jiangzhai and Hongshan cultures, but those metal artifacts were not widely used. In the region of the Aïr Mountains in Niger, we have the development of independent copper smelting between 3000 and 2500 BC. The process was not in a developed state, indicating smelting was not foreign. It became mature about 1500 BC. ^ a b c d The New Oxford Dictionary of English (1998) ISBN 0-19-861263-X, p. 301: "Chalcolithic /,kælkəl'lɪθɪk/ adjective Archaeology of, relating to, or denoting a period in the 4th and 3rd millennium BC, chiefly in the Near East and SE Europe, during which some weapons and tools were made of copper. This period was still largely Neolithic in character. Also called Eneolithic... Also called Copper Age - Origin early 20th cent. : from Greek khalkos 'copper' + lithos 'stone' + -ic". ^ Aeneolothic was once fairly often spelled Æneolithic, but the habit of using a ligature in ae and oe words of Greek and Latin derivation (fœtid, etc.) largely died out by the mid-20th century. ^ a b Bruce Bower (July 17, 2010). "Serbian site may have hosted first copper makers". ScienceNews. Retrieved 22 April 2017. ^ Potts, Daniel T. (ed.). "Northern Mesopotamia". A Companion to the Archaeology of the Ancient Near East. 1. John Wiley & Sons, 2012. p. 302. ISBN 978-1-4443-6077-6. ^ Fazeli, H.; Donahue, R.E. ; Coningham, R.A.E. (2002). "Stone Tool Production, Distribution and Use during the Late Neolithic and Chalcolithic on the Tehran Plain, Iran". Journal of Persian Studies. 40: 1–14. JSTOR 4300616. ^ Fazeli, H.; Donahue, R.E; Coningham, R.A.E (2002). "Stone Tool Production, Distribution and use during the Late Neolithic and Chalcolithic on the Tehran Plain, Iran". Iran. 40: 1–14. doi:10.2307/4300616. JSTOR 4300616. ^ D.W.Anthony, The Horse, The Wheel and Language: How Bronze-Age riders from the Eurasian steppes shaped the modern world (2007). ^ Méry, S; Anderson, P; Inizan, M.L. ; Lechavallier, M; Pelegrin, J (2007). "A pottery workshop with flint tools on blades knapper with copper at Nausharo (Indus civilisation ca. 2500 BC)". Journal of Archaeological Science. 34 (7): 1098–1116. doi:10.1016/j.jas.2006.10.002. ^ R. A. Birmingham and L. E. Eisenberg. Indian Mounds of Wisconsin. (Madison, Univ Wisconsin Press. 2000.) pp.75-77. ^ Neiburger, E. J. 1987. Did Midwest Pre-Columbia Indians Cast Metal? A New Look. Central States Archaeological Journal 34(2), 60-74. ^ Peterson, Christian E.; Shelach, Gideon (September 2012). "Jiangzhai: Social and economic organization of a Middle Neolithic Chinese village". Journal of Anthropological Archaeology. 31 (3): 241–422. doi:10.1016/j.jaa.2012.01.007. Pleger, T. C. (2002). "A Brief Introduction to the Old Copper Complex of the Western Great Lakes: 4000-1000 BC". Proceedings of Twenty-seventh Annual Meeting of Forest History Association of Wisconsin. Oconto, Wisconsin: Forest History Association of Wisconsin. Wikimedia Commons has media related to Copper Age.